March 27, 1969 – The Port of Chicago Unification Study Committee forwards a study to the Illinois Economic Development Commission that recommends closure of Navy Pier as a Chicago port in favor of new facilities in the Calumet region. The announcement precedes by one day hearings in the State of Illinois building, 160 North LaSalle Street, into widespread dock thefts that “threaten the future of Chicago as an inland seaport.” [Chicago Tribune, March 28, 1969] The committee’s report is unflinching in its appraisal, stating, “We must question the wisdom of assuming a bonded debt of 11.4 million dollars on a facility that currently is operating at a deficit and has such a limited potential for future use. The future of the port lies in the South Chicago area.” The report describes Navy Pier as a “deficit operation” with annual losses between $644,900 and $843,800 with $11.4 million in bonds still outstanding It recommends state funds be diverted from Navy Pier to develop a lakefront port site at the mouth of the Calumet River, property now owned by the Youngstown Steel Company. Other urban ports have begun to adapt to the shipping industry’s approach of shipping merchandise in large steel containers to reduce pilferage, and the commission makes clear that the facilities at Navy Pier will never be adequate to support this new method of operation. 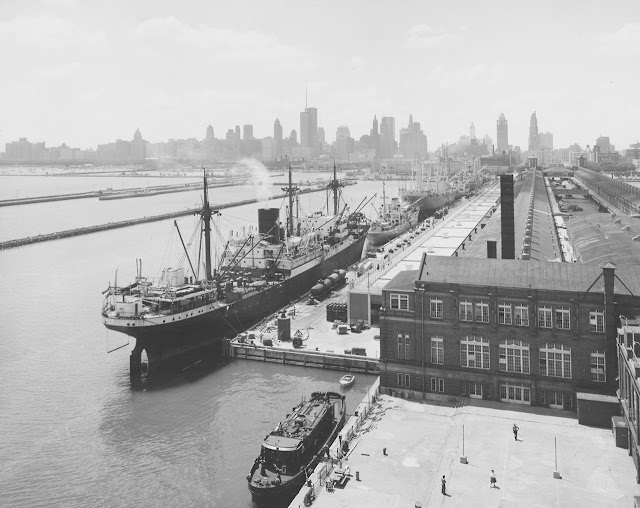 The head of the commission, Arthur B. Gottschalk, says, “We don’t believe money should be spent at Navy Pier to build more warehouses, piers, and jetties which would destroy our beaches and valuable lakefront property. A container port there is simply out of the question.” The above photo shows the pier in 1961 when it was still struggling valiantly to do the business of handling the city's shipping needs. March 27, 1939 – William Bryce Mundie dies at the age of 75. Mundie was born in Hamilton, Ontario and moved to Chicago in 1884 at the age of 21 where he began working as a draftsman for William Le Baron Jenney. By 1891 he was a full partner in Jenney’s firm and had married Jenney’s niece. Mundie was therefore in on the development of the earliest metal-framed commercial buildings, and his expertise led to his being named the supervising architect for the Chicago Board of Education from 1898 to 1905. He designed Wendell Phillips High School, along with Armour, Coonley, Hamilton, Patrick Henry, Plamondon, Darwin, Jungman and Sullivan elementary schools. Mundie was a charter member of the Cliff Dwellers, a member of the Union League Club, the Chicago Yacht Club, and a fellow of the American Institute of Architects, for which he served as vice-president for many years. Muncie's Wendell Phillips High School is pictured above. March 27, 1935 -- Officials of the Electro-Motive Company, a subsidiary of General Motors Corporation, break ground for a new plant in McCook, at which diesel-electric locomotives will be produced. H. L. Hamilton, the president of the company, says, "This new industry created by the railroads' demand for high speeds is as strange to us as it is to Chicago . . . we are planning in such a way that we can add to the plant as we get experience in the new art of building locomotives with diesel-electric power plants." Just west of Chicago, McCook, with a population of under 400, makes a particularly attractive choice for the locomotive manufacturer. First, it is close to the Indiana Harbor Belt line tracks, so getting raw materials in and finished locomotives out will be fairly easy. Secondly, the area has a bed of Niagara limestone just below the surface, an excellent foundation for the heavy fabricating equipment of the new production facility. 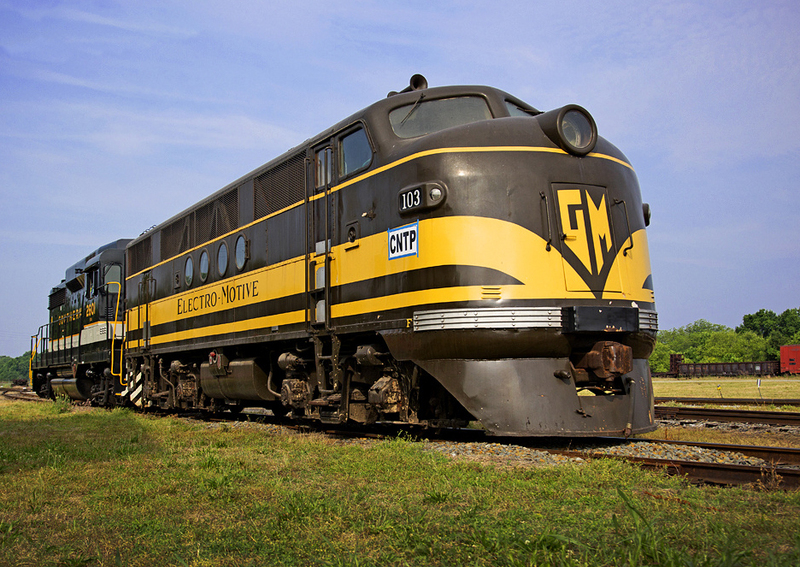 In 1938 the first road freight is tested on an 83,764 mile, 11-month run. The test shows that the locomotive can do twice the work of a steam engine at half the cost. With Chicago's ever more stringent ordinances against smoke pollution (the first such legislation went back at least to 1909), the new plant in McCook was profitable from the beginning. It stopped producing locomotives in 1991 when operations were transferred to London, Ontario. Pictured above is demonstrator FT103, the innovation that changed an industry.